Zeph 1:2KJV "I will save"
Theme: Judgment and doom are certain unless there is repentance. Only repentance will bring hope and restoration. Hosea - The Lord loves Israel despite her sin. 755-15 B.C. Joel - Judgment precedes Israel’s future spiritual revival. 835–796* B.C. Amos - God is just and must judge sin. 765-50 B.C. Obadiah - Sure retribution must overtake merciless pride. 848* B.C. Jonah - Divine grace is universal in its sweep. 780-50 B.C. Micah - Bethlehem-born Messiah will be mankind’s Deliverer. 740-690 B.C. Nahum - Doom is to descend on wicked Nineveh. 630-12 B.C. Zephaniah - The Day of the Lord must precede kingdom blessing. 625-10 B.C. Haggai - The Lord’s Temple and interests deserve top priority. 520 B.C. Zechariah - The Lord will remember His people Israel. 520-15 B.C. ; Zech 9–14 after 500 B.C. Malachi - Let the wicked be warned by the certainty of judgment. 433-400 B.C. Christ in All the Scriptures (A M Hodgkin): This short book has been called “The Compendium of all prophecy.” It is a survey of the universal government of Jehovah, His judgment of the whole earth. Zephaniah (“the watchman of Jehovah”) gives his own genealogy to the fourth generation, showing his descent from Hizkiah, who is probably identical with King Hezekiah. He prophesied during the early part of the reign of Josiah, before idolatry had been put away by the reforms of that king. Zephaniah’s prophecy is marked by the emphasis he lays upon the Day of the Lord. The final application is to the Day of Christ. The impressive language can only find its fulfillment in the great Day of His wrath, described in Revelation 6. “A day of wrath, a day of trouble and distress, a day of wasting and desolation, a day of darkness and gloominess, a day of clouds and thick darkness, a day of trumpet and alarm” (Zephaniah 1:14–16). But meanwhile, a day of judgment was near for Judah on account of her sins. He urges her to seek the Lord while there is still time. He then proclaims God’s judgment upon various nations which have oppressed God’s people—upon Philistia, Moab, Ammon, Ethiopia, Assyria, prophesying the fall and utter desolation of Nineveh. The third chapter shows God’s coming judgment upon Judah and Jerusalem, and the future restoration and joy of God’s people in the day of the Messiah. The Lord in the Midst. The third chapter contains a beautiful lesson, taken spiritually. It describes the sinful condition of a soul apart from Christ— Zephaniah 3:1, sins of commission; Zephaniah 3:2, sins of omission. Those who should have been leaders in righteousness are leaders in iniquity—princes, judges, prophets, priests. Then the Lord Himself takes the place of these leaders, and we see Him “in the midst,” fulfilling each office in turn. First He comes to our hearts as judge, and convicts us of all that is sinful there, bringing His judgment to light (Zephaniah 3:5–7). Second, He comes as Prophet, teaching us with pure lips to call upon His name—still “in the midst,” dealing with the pride of heart, and bringing us low into the place of blessing, in the presence of His holiness (Zephaniah 3:8–13). Third, He comes “into our midst” as King, to reign in undisputed sway in the heart that is surrendered to Him. When the Lord reigns thus the song begins (Zephaniah 3:14–16). The chapter closes with six beautiful “I wills” (Zeph 3:18, 19, 20) of what the Lord will do for us (Ed: See following note - yes for "us" but first for restored nation of Israel!). Editorial Note: Although the above paragraphs make spiritual application of this passage to believers of the present age, remember that the primary application is to the believing remnant of Israel, which the Lord has promised to restore, according to His unfailing love and the unconditional aspects of His covenant with that nation, when in the Messianic Kingdom, He is in the midst of them. These promises will be fulfilled ''at that time'' (read Zeph 3:19,20; cp. Isa 11:12; 27:12; Eze 28:25; 34:13; 37:21-28; Amos 9:14; Zech 2:10,11; 8:3). Zephaniah stooped low with the candle of searching and looked closely. The prophet describes the day of God's wrath, which will be fulfilled in the coming invasion and captivity of Israel. It foreshadows the final day of the Lord. The prophet predicts an outpouring of God's wrath upon certain peoples and nations. Read the history books and you will find that these have been fulfilled in minute detail. The terrible moral state of Israel is described. This is what called for and justified the judgment that was about to fall. This passage presents an interesting glimpse of the millennial period and the blessings Israel will experience during that time. Zephaniah 2 A Message of Doom to a Message of Hope! "The Book of the Twelve Minor Prophets"
Rosscup - This is the best older, overall treatment of a critical nature on the Old Testament Hebrew text verse by verse and is a good standard work to buy. The student can buy parts or the whole of this series. Sometimes it is evangelical, at other times liberal ideas enter… In prophecy it is amillennial. (Commentaries for Biblical Expositors: An Annotated Bibliography of Selected Works). D. Rudman, "A Note on Zephaniah," Biblica 80 (1999): 109-112. Sample Excerpt: I cannot refrain from calling attention very particularly to the promises for the future as contained in Zeph 3:8-20, and which show that although these Minor Prophets, so-called, refer but briefly to that period, (and yet perhaps in proportion after all, to the length of their discourses), still their deliverances thereupon are all in harmony with the teachings of the whole school of the prophets. For example, in Zeph 3:8, observe the agreement with Joel concerning the gathering of the Gentile nations to judgment at the end of the present age ("in those days… at that time" - Joel 3:1, 2). In Zeph 3:9, we seem to see these nations (Ed: Gentiles), or the spared and sifted remnant of them, at length converted to GOD and serving Him with a ready will. In Zeph 3:10 they are bringing the sons of Israel back to their own land, the second gathering of them, so to speak, as was explained in Isaiah (Isa 11:11-note). In Zeph 3:11-18, the cleansed, humble, trustful, rejoicing, nation of Israel appears, dwelling in their own land. In Zeph 3:19, 20 we find the restored and beloved people a praise and a blessing in the whole earth as foretold in the original promise to Abraham, and again and again pictured before us in the millennial Psalms. Zeph 3:17 of this chapter will well repay careful meditation. The old marriage covenant (cf "My covenant which they broke, although I was a husband to them" = Jer 31:31-32) between the Lord and Israel is there depicted as gloriously restored anew (Isaiah 62:5; Hosea 2:19); the husband is rejoicing in His wife (Ed: Israel in belief - cf Ro 11:25-29-note), resting in His love and joying over her with singing. The word for "rest" (charash = 02790) is translated in the margin "be silent," and this silence of the Lord towards His people (Israel) is no longer the silence arising from forbearance in order to punish at last (Psalm 50:21-note), but because He has nothing more to reprehend. Example Excerpt: We have mentioned this several times in our study of the prophets, but I will point it out in case someone has not heard the explanation. Several of the things Zephaniah says will happen, could have been fulfilled by the Babylonians when they destroyed Judah and took them into captivity. But many of the prophecies concerning the destruction of the nations and the earth have obviously not been fulfilled. 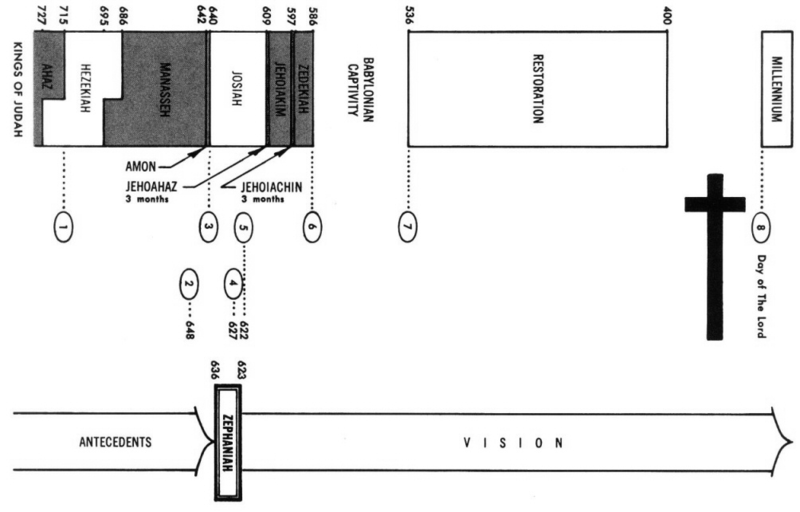 This is where it helps to understand what the prophet saw in his visions. RESTORATION OF THE GENTILES (Zeph 3:9-10) -The word “Peoples” refers to the Gentiles. The “purified lips” may be a reference to a reversal of the curse at the tower of Babel. Or an allusion to Isaiah’s unclean lips in Isaiah 6:5-note. In “that day” God will bless the Gentiles who turn to Him. “All the people” will call on the name of the Lord in that day. Have we reached that day yet? Obviously not. Over and over again we have seen that Gentiles would be saved and included in the kingdom of God. It shows how far off the religious leader’s of Jesus’ day were in their practice of Judaism. RESTORATION OF THE JEWS (Zeph 3:11-20) God will also bless the Jews and bring the remnant back to Jerusalem (My holy mountain). And there will be justice and peace in the land (Zeph 3:11-13). There will be no shame either. This was the same thing promised in Joel 2:26,27. Again, it is obvious that this has not happened. There will be rejoicing in the future kingdom, for God will be reigning in their midst and the nations will praise and honor Israel as God's people (Zeph 3:14-18,19, 20). Zephaniah 1:2 The prophetic declaration, God will completely sweep away everything on earth, is hyperbole. Though no one deserved to be spared, God would preserve a small remnant of Judah and of other peoples (Zeph 2:7,9b; 3:9-10,12-13). Zephaniah 1:3 The judgment language—sweep away man and animal (lit "cattle, wild beasts") even the birds of the sky and the fish of the sea—is more comprehensive than Noah's flood (Gen 6:7, no fish mentioned). To underscore the gravity of their sins and the intensity of their deserved punishment, Zephaniah used prophetic hyperbole (Jer 4:23-29; 9:9-11) in which creation itself is reversed; here the creatures are listed in reverse order from Gen 1:20-28 (sea creatures, birds, beasts, and man). In the phrase the ruins along with the wicked, "ruins" (Hb maksheloth; lit "stumbling blocks") were apparently idol paraphernalia, including animals worshiped by depraved people such as in Egypt or Judah (see Ezek 8:10-12 for detestable animal images in the Jerusalem temple). The Lord would destroy those idols and their worshipers. Zephaniah 1:5 To pledge loyalty to Milcom involved religious syncretism, combining pseudo-worship of Yahweh with worship of a false god. Here and in Jer 49:1,3, "Milcom" is spelled "Milcam" (lit "their king") in the Masoretic Text, which some interpret as a reference to Baal worship (see Zeph 1:4; cp. Jer 32; 35). Yet Milcom/Milcam was more likely the Ammonite god (Jer 49:1-3), interchangeable with "Molech" (1Ki 11:7; Jer 32:35). No consensus exists about the exact nature and spelling of this Ammonite deity; if equivalent to the Canaanite god of the underworld Molech, worship of this god apparently included child sacrifice (as in worship of Molech/Milcom; Lv 18:21; 20:2-5; 2Ki 23:10; Jer 32:35). This worship continued Manasseh's pagan practices which Josiah would disrupt (2Ki 23:10-13). Example Excerpt: Prediction of future restoration and blessing for Israel, Zeph 3:3, 7-20. The future according to Zephaniah. - This brief prophecy is full, as are all the other prophets. After the frightful picture of wrath which he so vividly draws, he changes to a sweet and triumphant theme, a song of gladness and of victory in which the glory of Zion, favor to the Lord’s people, God’s delight in His redeemed, the holiness and devotedness of the restored Israel are set forth in rapturous strains. He closes with a vision of hope and joy and peace. And so Zephaniah is apocalyptic and telesmatic. “The Lord thy God in the midst of thee is mighty; He will save, He will rejoice over thee with joy; He will rest in His love; He will joy over thee with singing,” Zeph 3:17. 1. He is mighty to save. 2. He exults over His redeemed. 3. He is silent in His love—finds no fault with them. 1. They are finally and forever delivered. 4. They are made perfect. 5. They are happy for ever. One thing that I've found in traveling is that if you aren't careful you can get turned around and headed in the wrong direction. Another thing is that once you are on the wrong road, it may be a while before you realize it. But usually there will be a sign or some other indication to show you that you are headed wrong. A person can avoid taking a wrong turn and wasting time and money if he will study his map well and keep a watchful eye upon the road. In our spiritual life we also sometimes get side-tracked. If we aren't careful we can take a wrong turn in our life and waste precious time or even worse. To avoid that from happening, God has provided the Bible for our map and the Holy Spirit as our guide. And yet with all of that, still many Christians get side-tracked in the world. However, there are some sign posts along the way.Read Zephaniah 3:1-7.These verses were written to the backslidden nation of Judah, but they offer some valuable information for us today. Look around and we can see the same warnings, the same signposts, to let us know that we need to make a change. When we find ourselves headed in the wrong direction, there is only one intelligent thing to do: turn around! The Bible calls that repentance; or changing our direction. Notice four sign posts in verse two. Zephaniah 3:14-17 When God Sings - see "Sermon Notes"
Zephaniah 3:17 The Mighty God in the Midst of Thee - see "Sermon Notes"
Recommended: NETBible notes are in the right panel. You can also select the tab for "Constable's Notes." See sample excerpts from these notes which are technical translation notes and brief commentary-like notes. Zephaniah 1:7 Note - The origin of the concept of “the day of the LORD” is uncertain. It may have originated in the ancient Near Eastern idea of the sovereign’s day of conquest, where a king would boast that he had concluded an entire military campaign in a single day (see D. Stuart, “The Sovereign’s Day of Conquest,” BASOR 221 : 159–64). 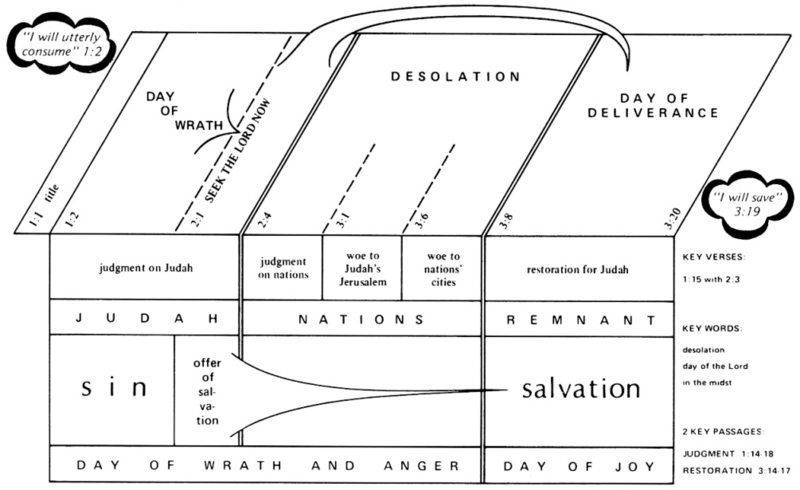 In the OT the expression is applied to several acts of divine judgment, some historical and others still future (see A. J. Everson, “The Days of Yahweh,” JBL 93 : 329–37). In the OT the phrase first appears in Amos (assuming that Amos predates Joel and Obadiah), where it seems to refer to a belief on the part of the northern kingdom that God would intervene on Israel’s behalf and judge the nation’s enemies. Amos affirms that the Lord’s day of judgment is indeed approaching, but he declares that it will be a day of disaster, not deliverance, for Israel. Here in Zephaniah, the “day of the Lord” includes God’s coming judgment of Judah, as well as a more universal outpouring of divine anger. Zephaniah 1:16 Note - This description of the day of the LORD consists of an initial reference to anger, followed by four pairs of synonyms. The joining of synonyms in this way emphasizes the degree of the characteristic being described. The first two pairs focus on the distress and ruin that judgment will bring; the second two pairs picture this day of judgment as being very dark (darkness) and exceedingly overcast (gloom). The description concludes with the pairing of two familiar battle sounds, the blast on the ram’s horn (trumpet blasts) and the war cries of the warriors (battle cries). Zephaniah 2:15 Note - Hissing (or whistling) and shaking the fist were apparently ways of taunting a defeated foe or an object of derision in the culture of the time. Zephaniah 3:14 - This phrase is used as an epithet for the city and the nation. “Daughter” may seem extraneous in English but consciously joins the various epithets and metaphors of Israel and Jerusalem as a woman, a device used to evoke sympathy from the reader. Sample Excerpt - Elizabeth Browning, in her poem, the Seraphim, describes the angels watching the work of the Son of God on earth and at last, seeing with stupefied amazement the incarnation and ultimately the cross, one angel looks at this host of ransomed souls and he says to the other, "Hereafter shall the blood bought captives raise their passion song of blood." And the other one replies, "And we extend our holy vacant hands toward the throne and cry, 'We have no music.'" You see, only the redeemed can sing like this. After the darkness, after the slaughter, after the terrible destruction comes the time of the singing. That is what God is after in your life. That is possible on the level of the Spirit right now when God deals death's stroke against the flesh within us and brings us through that painful experience of saying no to the ego and the self-life. There follows the time of the singing, the time that he is after, the reason he takes us through the pain and the darkness. What you see to be true of the individual life will also be true on the whole wide canvas of history as God brings human history to an end. THERE is a "may be" about all temporal things; and in pleading for them we ask with much diffidence. Yet we may plead confidently when our appeal is made to God in the day of his anger. Then our need is pressing: it is for our life that we are pleading, and the Lord is very gracious in our extremities. In spiritual things we may draw encouragement from the faintest sign of hope when it proceeds from God: "it may be ye shall be hid." The seeking for refuge, here commanded, is directed only to the meek and righteous; but it is our joy to proclaim a hiding place for the guilty, and to bid them seek the Lord even on the least encouragement. "Seek the Lord"; or, repent and trust in Jehovah. "Seek righteousness." Directed as it is in the text to those who are already righteous, it bids them persevere in righteousness. "Seek meekness." Spoken to the meek, it bids them bow even more humbly before the chastening hand of God. But our point is this: that we may seek the Lord upon the faintest encouragement. There are strong inducements and large promises; but if we cannot grasp these we may come even with a "may be." I. IN MANY A RECORDED INSTANCE "MAY BE" HAS PROMPTED AND JUSTIFIED A RIGHT ACTION. From the cases which we will mention lessons may be learned. 1. A "may be" led Jonathan to attack the garrison of the Philistines (1 Sam. 14:6). "It may be that the Lord will work for us: for there is no restraint to the Lord to save by many or by few." This should nerve saints for holy enterprises. 2. A "may be" Cheered David when Absalom rebelled, and Shimei cursed (2 Sam. 16:12). "It maybe that the Lord will look on mine affliction." Let us hope in God in our darkest hours. 3. A "may be" induced the lepers to visit the Syrian camp (2 Kings 7:4). Their desperate venture should be laid to heart by those who are in like condition. They can but perish in any case; let them seek the Lord, and try whether he does not save. 4. A "may be," diluted with an "if so be," moved the afflicted to humble himself. See Jeremiah's Lamentations 3:29. Let no tried soul refuse the like hope. 5. A "may be," in the form of "Who can tell?" brought all Nineveh to repentance (Jon. 3:9). If others have acted so vigorously upon such slender encouragement, may not we, when dreading the ruin of our souls, act with like decision and hopefulness? If we fly to Jesus by childlike faith, there is more than a "may be" that the result will be happy. II. IN THE INSTANCE OF A SINCERE SEEKER THE "MAY BE" HAS UNUSUAL STRENGTH. 1. Consider the gracious nature of our God (Mic. 7:18). 2. Consider the glorious work of Christ for sinners (1 Tim. 1:15). 3. Consider the mercy they have already received. "It is of the Lord's mercies that we are not consumed (Lam. 3:22). 4. Consider the number and character of those who have been saved. (Rev. 5:9; 7:9; 1 Cor. 6:11). 5. Consider the omnipotence of the Holy Spirit (John 3:8). 6. Consider the glory which is to be the Lord's at the last: surely it will come by saving souls, and saving many of them. III. BUT IN THE SEEKERS CASE HE HAS FAR MORE TO GO UPON THAN A MERE "MAY BE." Repentance (Prov. 28:13; Isa. 55:7). Faith (Mark 16:16; John 3:18; Acts 16:31). Prayer (Matt. 7:7; Acts 2:21). Let these promises be studied, and their encouragement accepted by immediate compliance with their requirements. Consider that God foresaw all events when he made these promises, and accordingly he has not made them in error. Consider that he cannot withdraw his promise. Consider that he is the same as when he made the promise, and so in effect makes it again every day. Consider that it will be a crime to doubt the Lord our God, and an act of reverence to believe him. Venture now upon the bare promise of God, who cannot lie (Titus 1:2). O sinner, seek the Lord! He comes to you in Christ Jesus. Look to him at once, and live. Dr. John Duncan was once heard thus addressing a beggar-woman in Edinburgh — "Now, you'll promise me that you'll seek: but mind, seeking will not save you, yet it is your duty; and it: you seek you'll find, and finding will save you." How long a beggar will wait, and how eagerly he will plead, although he has no promise of an alms, but only the bare chance of winning a penny from a passer-by! How laboriously will fishers cast their nets again and again, though nothing has been taken as yet, and their only encouragement is the possibility that fish may come that way! How desperately will men dive into the sea with the expectation of finding pearls in oyster-shells, encountering fierce monsters of the deep with the uncertain hope of being enriched! And will not men draw near to God when their outlook is so much more bright, their expectation so much more justifiable.? As for me, I will lay down my sick soul at Christ's feet, in sure and certain belief that he will heal me, and then I will follow him whithersoever he goeth, in calm assurance that he will lead me to his eternal kingdom and glory. — C H. S.
WHEN the Lord is judging men he does not spare those who are called his people: Moab and Ammon and Nineveh are visited, and Jerusalem is not spared. There are sins which outsiders cannot commit, such as those of the text. When peculiar privileges only create peculiar sins, they will be followed by peculiar punishments. The offenses mentioned in this verse are to be found in nations, churches, and individuals unto this day: and in a measure among God's own people. I. IN THE TEXT WE PERCEIVE FOUR MANIFEST SINS. 1. We will make upon them, as a whole, four observations. Sins of omission are sure to exist where there are sins of commission. Jerusalem is said to be "filthy and polluted," and then these omissions are recited. Sins of omission rank with the blackest of offenses. Consider the context, and see with what fearful crimes omissions are catalogued, as if to mark their vileness. Sins of omission go in clusters. "She obeyed not." "She received not instruction." "She trusted not." "She drew not near to her God." How many foul birds may dwell in one nest! One sin never goes alone. Sins of omission are none the less when they are mainly spiritual. Such are those mentioned in the text, and they are cited among crimes of deepest dye. 2. We will note each one of the four separately. They heard God speak, but they took no heed. This included rebellion, hardness of heart, presumption, and defiance of the Lord; and all this after solemn warnings, great instruction, and tender invitation. They felt correction, but were not instructed. This involved greater persistence in rebellion, and still more obduracy of heart. They were unbelieving and distrustful, and relied upon idols, and not upon the Lord. Unbelief is a master-sin. They had no communion with their God. "Her God" implies existence of covenant-relationship, in name at least; but there was no worship, love, or service. These four sins abound around us, and among us. Inattention, Obstinacy, Unbelief, and Aversion to God are all common. They involve men in misery in this life, and in eternal ruin in the world to come. Are they not destroying some of you? II. IN THE TEXT WE SPY OUT FOUR HIDDEN ENCOURAGEMENTS TO SEEK BETTER THINGS. 1. God does speak to men. He may speak to us again. 2. God corrects for our good. It is meant for instruction, not for destruction (see the margin). 3. God would have us trust him. He would not blame us for not trusting if we were not permitted to trust him. 4. God would have us draw near to him. Else it were not mentioned as our sin that we do not draw near to him. All this applies to us at this day. Still the Lord is in the midst of us, reading our inmost souls. Let us lay our sins to heart, and seek his face through Christ Jesus. The last words that Archbishop Usher was heard to say were these: "Lord, forgive my sins, especially my sins of omission." No sin is ever alone. Dr. Macdonald says, "There is no fault that does not bring its brothers and sisters and cousins to live with it." INTENDED FOR READING ON LORD’S-DAY, MARCH 31ST, 1901. “He will rest in his love.” — Zephaniah 3:17. Well might the poet have put that question, if he had risen up from reading this third chapter of the prophecy of Zephaniah. O people of God, open your ears and your hearts while Jehovah thus speaks to you by the mouth of his ancient prophet, “Sing, O daughter of Zion; shout, O Israel; be glad and rejoice with all the heart, O daughter of Jerusalem. The Lord hath taken away thy judgments, he hath cast out thine enemy: the King of Israel, even the Lord, is in the midst of thee: thou shalt not see evil anymore. In that day it shall be said to Jerusalem, Fear thou not: and to Zion, Let not thine hands be slack. The Lord thy God in the midst of thee is mighty; he will save, he will rejoice over thee with joy; he will rest in his love, he will joy over thee with singing.” The words are very simple, but the promises they convey are so weighty that the verses roll along like the triumphant periods of a jubilant poem. The truth of God, even when told in the simplest words, is very much akin to the loftiest poetry; and I might, without the slightest hesitation, declare that there never was any poem, composed by human intellect, which could match for a moment, in the sweetness of its notes, the succession of precious promises which God here proclaims in the ears of his chosen ones. We cannot, on the present occasion, enter into the wondrous depths of the promises here revealed. We should need, indeed, a long period of time before we should be able to explain them; and, possibly, the whole of life will scarcely be sufficient for us fully to realize these great truths in our own experience. We will, therefore, at once turn to the few words I have chosen as my text, “He will rest in his love,” and we shall consider these words as referring to the Lord Jesus Christ, and as relating to his divine and matchless love, which he hath manifested toward his people in the wondrous works of grace which he has accomplished for them and in them. “He will rest in his love.” This short sentence is capable of several interpretations, and each view we take of it has in it something extremely delightful. I. Here is, first of all, The Doctrine, That Christ Will Keep Ever Faithful To Those Upon Whom He Has Set His Heart’s Affection. The love of human beings is a fitful and flickering flame; it may be set, for a season, with apparent constancy upon a certain object; but you can never tell how long it will remain steadfast. However firm, however true, and however fervent it may seem to be, and even really may be, yet trust it not so implicitly as to come under that ancient sentence, “Cursed be the man that trusteth in man, and maketh flesh his arm, and whose heart departeth from the Lord.” Trust not too much to any friend whom you may have; put not all your confidence in any man, for the best of men are but men at the best, and the firmest of men are subject to the infirmities and the frailties of their race. But God’s love is no flickering flame; it does not flare up for a little while, like the crackling of thorns under a pot, and then die out in darkness; it is not to be set forth by the image of a fool’s mirth, which lasteth but for a little season. It beginneth, it waxeth vehement, it diminisheth not, but it groweth from strength to strength, till what seemed at first to be but a single spark, becomes a mighty flame, and what was a flame becomes like the beacon-lights of war, and what was but as a beacon becomes as the sun itself, in the fierceness of its heat and in the majesty of its goings. There are some who teach that Christ’s love may be set upon a man, and yet that it may afterwards be removed from him. Where, then, remains the comfort of God’s people if their teaching is true? But, thank God, it is not true; for the promise of the text is that Jesus “will rest in his love.” If their doctrine is according to the Scriptures, where is the value of Christ’s affection at all? In what respects can he be said to stick closer than a brother? How can it be true that many waters cannot quench his love, neither can the floods drown it? If these men are right, must not the apostle Paul have been wrong when he declared that he was persuaded that neither death, nor life, nor angels, nor principalities, nor powers, nor things present, nor things to come, nor height, nor depth, nor anything else in the whole of creation should ever be able to separate the saints from the love of God which is in Christ Jesus their Lord? Shall we imagine that the apostle was mistaken, and suppose that this erroneous teaching is the truth of God? Shall we turn away from the positive testimony of Holy Scripture, and believe the falsehoods of men in its place, especially when that Scripture is itself so full of consolation to God’s people that, if it can ever be proved to be untrue, they may put their hands upon their loins in agony of woe, and go to their graves full of misery and despair? But, beloved, ye know right well that Jesus Christ’s love, when once it has engraved your name upon his hand and his heart, will never suffer that name to be erased. Ye believe, and ye believe aright, that he who has a portion in the heart of God has an eternal portion. He who can claim for himself a share of the Father’s love, of the Son’s redemption, and of the Spirit’s care, need never be afraid that all the thievish hosts of hell shall rob him of his divine inheritance. For look ye here, brethren, what is there, to separate you and me from Jesus Christ’s love, which has not been tried already? Further, if Christ had intended to cast us away because of our sins, why did he ever take us on? Did he not know, beforehand, that we should be rebellious, and did not his omniscient eye see all our sins, and detect all our follies? Are we ungrateful? He knew that we should be. Are our sins extremely heinous? He knew how heinous they would be. He could foresee all; every spot that was to be upon us, was upon us, before his omniscient eye, when he chose us; every fault that we should commit was already committed in his estimation. He foreknew and foresaw all; yet he chose us just as we were. If he had intended to abandon us, and cast us away, would he ever have accepted us at all? If Jesus meant to divorce his bride, foreknowing all her faults, would he ever have espoused her? If he determined to cast away his adopted child, since he knew that child’s unfaithfulness, would he ever have adopted him? Oh, think not, beloved, that Christ would have done all that he has done for nothing, that he would have come from heaven to earth, and have even gone from the cross to the grave, and allowed his spirit to descend into the shades of Hades, on a bootless errand! Would he not have started back, and said, “I know my bride will prove to be unworthy, therefore I will not espouse her”? But since he has espoused her, and has put the red ring of his own atonement on her finger, and has hitherto been faithful to her, what shall ever constrain him to divorce her? What can ever induce him to cast from his bosom her whom he died to save? It must be true that “he will rest in his love,” for he has hitherto rested in it, though he has had much to mourn over in his chosen ones. Sin and sorrow, therefore, are perfectly incapable of rending us from the heart of Christ, for he must, “he will rest in his love.” And this truth will seem all the more plain and clear if we just pause a moment, and think of our relationship to God the Father and to God the Son. Is not every Christian God’s child? And did you ever know a true father who hated his own child? You may have known such a father, but it was unfatherly for him to hate his own son. Have you known a father who has cursed his son, and driven him forth from his home, and declared that he was not his child? You may have known some men of that kind, or you may have heard of such unnatural creatures; but, mark you, the father’s curse could not unchild his child; — he was still his father’s son, even when he was cursed by him. Not even the foulest words that ever came from the most embittered heart could ever take away that child’s right to call that man his father; a child is a child forever if he is once a child, and a father is a father for aye if he is once a father. Now, beloved, in the usual course of nature, we find that men will do anything for their children that they possibly can do. Here is a poor creature, born into the world, nearly an idiot; — it has not its senses right, it is nearly blind and deaf, and its parents know that, even if they can bring it up, it will always be a trouble to them; yet you see with what studious care the father and mother endeavor to save the poor child’s life. While others say, “If it were to die, it would be a happy release,” both father and mother feel that they would be losers by its death. “Ah!” said one good old divine, “if a father could have a child that had lost eyes and ears, and feet and hands, though he could not breathe in a natural fashion, though he could not feed without some extraordinary means for the digestion of his food, event then his father would do his best to keep him alive; and so surely shall it be with that great Father, who, when he speaks of himself, and of us, always puts his Fatherhood far higher than ours, as Christ did when he said, ’If ye, then, being evil, know how to give good gifts unto your children, how much more shall your Father which is in heaven give good things to them that ask him?’ And truly I may say, if an earthly father does not wish to lose his child, if he would endeavor to save his child’s life though it was loaded with ten thousand diseases, how much rather shall our Father who is in heaven see to it that none of his little ones shall perish, but that every one of them shall be preserved!” Do you not see that, because we are God’s sons, we are, therefore, Jesus Christ’s brothers, and “he will rest in his love”? But there is yet another thought, for we have a relationship also to Christ, and therefore “he will rest in his love.” We have never yet heard of a man who hated his own flesh. Strangely wicked as it is, we have heard of men who have hated their flesh in the mystic sense of the marriage tie, and who have driven their wives from them with all manner of brutality and cruelty. She whom the husband promised to cherish and to nourish, he has driven away, yet he has never thus treated his own flesh; the man may have become cruel and unnatural towards her who is his own flesh by marriage, but not towards his own literal flesh. Now, Jesus Christ has taken his people into such a connection with himself that they are nearer to him even than the wife is to the husband; they are as near to him as our own flesh and blood are to our own head. What will not a man do to save his hand, or the least member of his body? Would he ever cease to care for even the feeblest portion of his frame? No; men are generally careful enough of their own flesh and blood; much more, therefore, will our Lord Jesus Christ protect the members of his mystical body, for we are his fullness, the fullness of him that filleth all in all. And will Christ lose his own fullness? Shah his body be dismembered? Shall the head become a bleeding head, and the trunk become a corpse? Shall any one member be left to die, to burn, to be destroyed? Oh, no! As surely as we are brought into this relationship with Christ, so surely are we saved beyond any hazard. This is one meaning of the text, and most consolatory to the tried, tempest-tossed child of God. II. I think, however, that there is another very sweet meaning to it; that is, Christ Has Labored In His Love, And He Now Rests In It. Let me draw a picture for you. Here is a man, who loves his hearth, and his home, and his country, and his Queen. The sound of battle is heard in the land, so he girds his sword upon his thigh, and marches forth to defend all that is dear to him. He fights, he struggles, his garments are stained with blood, and he himself is wounded. It is love — love of his own safety, and of his family, and of his country, that has made him fight so bravely. And now that the deed is done, he comes back to his home. The foe has been swept from the white cliffs of Albion, and the land of liberty is still free; Britons are not slaves. The man retires to his house, and you see how quietly he sleeps, how joyously he sits down under his own vine and fig tree, none daring to make him afraid. With what joy does he now look upon the faces of those whom he has defended, and upon the home for which he has fought! What satisfaction does it give him to know that the honor of his country is still unstained, and his land is still the home of the free! Now he rests in his love; that which made him fight, now gives him joy; that which impelled him in the day of battle to do great deeds of heroism, is its own sweet reward. Now he rests because the battle is fought, the victory is won, and he, therefore, rejoices in the very love which once caused him to labor. III. I find that Dr. Gill gives this as one of the meanings of the text, for he is always noted for giving a great variety of meanings to a text; and, sometimes, nobody knows which is the true one. There is something very sweet in love; whether it is sweeter to be loved or to love, I know not; but, certainly, when the two experiences meet together, they are like two noble rivers which have flowed through a rich and fertile country, and then combined to make some great lake, or inland sea; then are they broad waters indeed. Now, Christ sees our love; the love which he has put into us meets the love which he has poured out towards us; and in both of these he finds a sweet solace. He solaces himself in love; this it is that cheers and comforts him. Some men, when they would be cheered on earth, drink the wine which stirs their blood; some men find comfort in company, and the noisy, thoughtless talker makes them glad; others, when they would be solaced, turn to books; these are their joys. Others, when they would be satisfied, chink their gold, look over their mortgages, their estates, their bonds, and things of that kind; and some men there are, who in this world have nothing sweeter for solace than the love of those who are near and dear to them. The man who loves his home and his family, and finds his little earthly heaven around his own hearth, is one of the happiest men I know. Treasure that thought for a moment, and think of Christ as taking delight in his family. I never yet heard that Christ rests in his power. He has great power; see what he has done. He has built the heavens; he has stretched out the earth, and he upholds the clouds with his might: but he never rests there. I know, too, that he has great wisdom: he knows all things in the ages past, in the time present, and in the centuries yet to come. He can unravel mysteries, and foretell all things, yet I never heard that he rested in his wisdom. There is a great crowd of angelic spirits, ever waiting in his courts above, and he, as King, sits in the very center of them all, and before him principalities and powers cast their crowns; but I never heard that he rested even in their homage. No; our Lord Jesus Christ is like the man who loves his family; he rests in the midst of his own beloved ones, — his spouse’s bosom, the place where he hears his children cry, where he listens to their prayers, the door at which he receives their thanksgiving, and bestows his blessing, the house where they wait on him and he waits on them, where they commune with him, and he communes with them; — that is the place where he rests. He rests in his love, in the midst of the objects of his love; there it is that he finds his own eternal satisfaction, the solace of his heart. Is not that a sweet thought? It has ravished my soul, while turning it over, to think that Jesus Christ should ever find his rest among the poor sons of men. Long ago, it was said of him, “His delights were with the sons of men,” and now that is his rest, too. Oh, how pleasant it is for us to know that our Lord will not sleep anywhere but in the house of his beloved, and ’neath no other tree will he recline but beneath the trees of his own right-hand planting! It is very easy for me to say of Christ, “As the apple tree among the trees of the wood, so is my Beloved among the sons;” but it is surprising that he should ever say the same of me. I can say of him, “I sat down under his shadow with great delight, and his fruit was sweet to my taste;” but it is wonderful for him to say the same of me, or to turn to some poor saint, and say to him, “O soul! thou art weary, but thou art my rest, and I am thy rest; thou art sick, but thou art my health, and I am thy health; thou art sad, but thou art my joy, and I am thy joy; thou art poor, but thou art my treasure, and I am thy treasure; thou art nothing, and yet thou art my fullness, and I am thy fullness!” Oh, what a host of precious thoughts we can meditate upon here! We have started a whole covey of sweet things, and we might profitably stand still, and admire them. It is not merely one sweet thought, but many that are included in this one precious truth, “He will rest in his love.” He never rested till he found that all his love was given to us, and he never will rest completely till all our love is given to him. Why is this? What can silence have to do with love? One old divine thinks that Christ means, by this expression, to say that his love is so vast that it can be better heard by his saying nothing than by his attempting to express it. What a great deal Christ has said, in the Scriptures, about his love; and yet hearken, O spouse of Christ, the love that he hath not spoken is ten times more than anything he has yet said! Oh, yes; there is much love which he has brought out of the treasure-house, and given to you; but he has much more like it in that divine heart of his. Some drops of his love you have already received, but those bright clouds on high, those storehouses of his grace, contain treasures of which you have never yet even dreamed. When you read one of the promises, you say, “Ah, this is indeed precious!” Yet, recollect that what our Lord has revealed in his Word is not a tenth of what he has not said. He has said many rich things, but there are richer things still. He has not said them, he cannot say them, because they are unsayable, they are unutterable, they cannot be declared; at least, not at present. When you get to heaven, you will hear them; you cannot hear them here. What a wonderful rush of exuberant gladness there is in these words! The swift, short clauses, the triple invocation in the former verse, the triple promise in the latter, the heaped together synonyms, all help the impression. The very words seem to dance with joy. But more remarkable than this is the parallelism between the two verses. Zion is called to rejoice in God because God rejoices in her. She is to shout for joy and sing because God’s joy too has a voice, and breaks out into singing. For every throb of joy in man’s heart, there is a wave of gladness in God’s. The notes of our praise are at once the echoes and the occasions of His. We are to be glad because He is glad: He is glad because we are so. We sing for joy, and He joys over us with singing because we do. I. God’s joy over Zion. It is to be noticed that the former verse of our text is followed by the assurance: ‘The Lord is in the midst of thee’; and that the latter verse is preceded by the same assurance. So, then, intimate fellowship and communion between God and Israel lies at the root both of God’s joy in man and man’s joy in God. We are solemnly warned by ‘profound thinkers’ of letting the shadow of our emotions fall upon God. No doubt there is a real danger there; but there is a worse danger, that of conceiving of a God who has no life and heart; and it is better to hold fast by this—that in Him is that which corresponds to what in us is gladness. We are often told, too, that the Jehovah of the Old Testament is a stern and repellent God, and the religion of the Old Testament is gloomy and servile. But such a misconception is hard to maintain in the face of such words as these. Zephaniah, of whom we know little, and whose words are mainly forecasts of judgments and woes pronounced against Zion that was rebellious and polluted, ends his prophecy with these companion pictures, like a gleam of sunshine which often streams out at the close of a dark winter’s day. To him the judgments which he prophesied were no contradiction of the love and gladness of God. The thought of a glad God might be a very awful thought; such an insight as this prophet had gives a blessed meaning to it. We may think of the joy that belongs to the divine nature as coming from the completeness of His being, which is raised far above all that makes of sorrow. But it is not in Himself alone that He is glad; but it is because He loves. The exercise of love is ever blessedness. His joy is in self-impartation; His delights are in the sons of men: ‘As the bridegroom rejoiceth over the bride, so shall thy God rejoice over thee.’ His gladness is in His children when they let Him love them, and do not throw back His love on itself. As in man’s physical frame it is pain to have secretions dammed up, so when God’s love is forced back upon itself and prevented from flowing out in blessing, some shadow of suffering cannot but pass across that calm sky. He is glad when His face is mirrored in ours, and the rays from Him are reflected from us. But there is another wonderfully bold and beautiful thought in this representation of the gladness of God. Note the double form which it assumes: ‘He will rest’—literally, be silent—‘in His love; He will joy over thee with singing.’ As to the former, loving hearts on earth know that the deepest love knows no utterance, and can find none. A heart full of love rests as having attained its desire and accomplished its purpose. It keeps a perpetual Sabbath, and is content to be silent. But side by side with this picture of the repose of God’s joy is set with great poetic insight the precisely opposite image of a love which delights in expression, and rejoices over its object with singing. The combination of the two helps to express the depth and intensity of the one love, which like a song-bird rises with quivering delight and pours out as it rises an ever louder and more joyous note, and then drops, composed and still, to its nest upon the dewy ground. II. Zion’s joy in God. It becomes us to see to it that our religion is a religion of joy. Our text is an authoritative command as well as a joyful exhortation, and we do not fairly represent the facts of Christian faith if we do not ‘rejoice in the Lord always.’ In all the sadness and troubles which necessarily accompany us, as they do all men, we ought by the effort of faith to set the Lord always before us that we be not moved. The secret of stable and perpetual joy still lies where Zephaniah found it—in the assurance that the Lord is with us, and in the vision of His love resting upon us, and rejoicing over us with singing. If thus our love clasps His, and His joy finds its way into our hearts, it will remain with us that our ‘joy may be full’; and being guarded by Him whilst still there is fear of stumbling, He will set us at last ‘before the presence of His glory without blemish in exceeding joy. (1) Read the Scripture literally (unless the text is clearly figurative, e.g., Jesus said "I am the door… " Jn 10:9). If one interprets a text symbolically (allegorically, figuratively, spiritualizing) when that text makes good sense literally, one potentially opens themselves to the danger of inaccurate interpretation, for then the question arises as to who's "symbolic" interpretation is correct and how imaginative one should be in evaluating a "supposed symbol"? Many of the commentaries and sermons on the OT prophetic books unfortunately are replete with non-literal interpretations (except when it comes to Messianic Passages, which are usually interpreted literally). Therefore the watchword when reading any commentary on Old Testament prophecy is caveat emptor ("buyer beware"). Read all commentaries like the Bereans (Acts 17:11-note). (3) Passages addressed to Israel should be interpreted as directed to the literal nation of Israel and should not be interpreted as addressed to the NT Church, an entity not mentioned in the Old Testament. The promises of Jehovah to the nation of Israel (e.g., see Millennial Promises) remain valid (Jer 31:35, 36, 37, Nu 23:19, Lk 21:33) and have not been passed on to the NT Church because Israel has "defaulted" (See study Israel of God). Remember that while Scripture has only one correct interpretation, there can be many legitimate applications (See Application), and therefore the OT prophetic books are extremely applicable in the lives of NT believers. (4) Scripture is always the best commentary on Scripture. While an attempt has been made to list resources that adhere to these basic interpretative guidelines, not all the works listed in these collections have been read in detail. Therefore should you discover a resource you feel is NOT conservative and/or orthodox, please email your concerns.